BlueScope Steel’s innovative coated steel roofing materials, Clean COLORBOND® MATT and Clean COLORBOND® ULTRA MATT steels, reduce specular reflection and minimises glare.Multinational steel supplier, BlueScope Steel, has introduced an innovative coated steel roofing material to the African market, which reduces specular reflection and minimises disturbing glare from a coated metal roof. Formed into a variety of roofing profiles by leading South African roll formers and roofing specialists, the product is available in a range of durable and attractive colours that closely resemble the standard Clean COLORBOND® range. 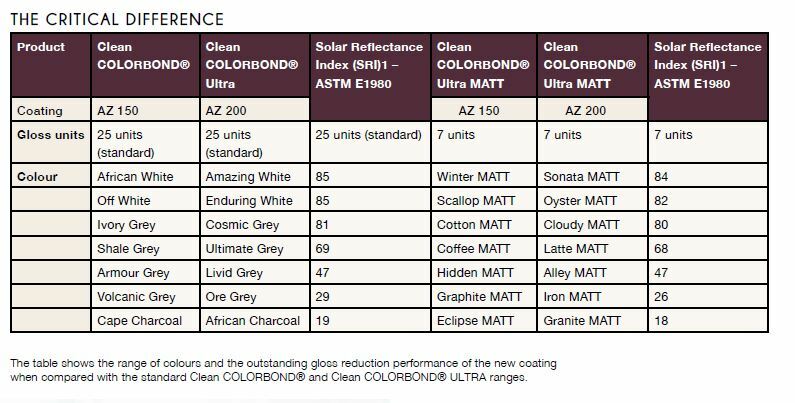 However, that is where the similarity ends, since Clean COLORBOND® MATT (AZ 150) and its ULTRA version (AZ 200) incorporate a new unique performance coating, specially designed to reduce the problems of glare caused by today’s high gloss steel roofs. This glare, or daylight reflectance, is defined as a measurement of the percentage of visible light reflected off the material surface. Usually, when light falls unto a surface, a certain percentage of light will be absorbed by the material, part of it reflected off the surface, and the remaining transmitted through the material. There are two main types of daylight reflectance; namely specular reflection and diffuse reflection. A specular reflection occurs when light is reflected in a concentrated, mirror-like material, while a diffuse reflection is scattered and unfocused, meaning much less glare. In the case of reflectance from exterior cladding and high pitch roof, the type of reflectance is mainly caused by specular reflection. Modern green building trends make it preferable to have a roof with high solar reflectivity so that inbound solar infrared radiation is not absorbed into the building, but simply bounced back into the atmosphere. This reduces the temperature of the roof, hence a cooler building inside. “With continuous improvements in construction technology and material science, the demand for more aesthetically pleasing and unique structures with low specular reflection has increased,” says BlueScope Steel’s regional manager for Africa, Arno Hanekom says. “Users are able to mitigate the issue of daylight reflectance without any compromise to our products’ aesthetic beauty and quality, and minimal change to our legendary the high Solar Reflectance Index (SRI) performance offered by Clean COLORBOND® with THERMATECH™. “Still incorporated into these products is our legendary THERMATECH™ technology, which allows the steel to achieve greater thermal performance with no compromise to quality. So, apart from its low daylight reflectance feature, the product also provides high dirt resistance, chalk resistance and gloss retention. It is able to help the building owner to save energy from costly climate control measures while it mitigates the Urban Heat Island (UHI) effect,” he explains. The measurement scale, Gloss Units (GU) of a gloss meter, is a scaling based on a highly polished reference black glass standard with a defined refractive index having a specular reflectance of 100GU at the specified angle – normally 60°. The most commonly used standard defines an upper point calibration of 100 and lower end point of 0 for a completely matt surface. First made available to the Singaporean market in 2014, Clean COLORBOND® Matt was brought to South Africa to support the prestigious east extension project of the Cape Town International Convention Centre. The new product aims to provide a gloss rating of 7 +/- 3 units. Speaking about the use of the new product at the CTICC extension, Rudolf Estyerhuyse of architectural firm Stauch Vorster said: “The specification makes perfect sense considering BlueScope Clean COLORBOND® MATT ULTRA’s aesthetic and technical qualities. The Matt finish provides an elegant textural appearance as an alternative to the standard gloss finish. According to Hanekom, the matt product has set a new standard for steel roofing and cladding with stylish matt finish, suited to address the issues of glare from sunlight common in urban areas. “Since the CTICC project, it has been specified on several other important projects”, he says. On the domestic housing front, the product was recently used in cladding an extension to a heritage home right near the sea in Kalk Bay, Cape Town. • V&A Silo Precinct – Silo’s 3, 4, 5. • Whale Coast Mall, Hermanus. • Ballito Mall , KZN. • Sitari Estate – including all residential, Curro School, Gate House, Checkers and other commercial. 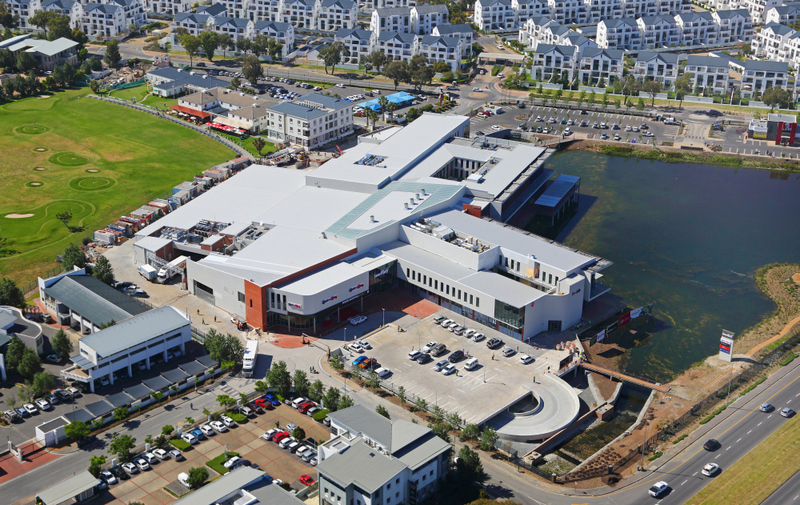 The Sanctuary Shopping Centre in Somerset West has a Clean COLORBOND® MATT ULTRA roof in the Latte Matt colour.